Minehunter vessels could soon be playing more of a stand-off surveillance role as Navies step up their deployment of robotised mine countermeasure systems. Since the beginning of the year, French-based ECA Group has delivered several fully robotised underwater mine countermeasure systems to two navies, Kazakhstan being one of them. According to ECA, they are the first unmanned mine countermeasure systems ever manufactured. For the first time, customers can deploy vehicles that will protect their crews keeping them outside the minefield. Until recently, the detection sonar was located on the minehunter vessel, which required entering the threat area and being exposed to a risk of explosion. 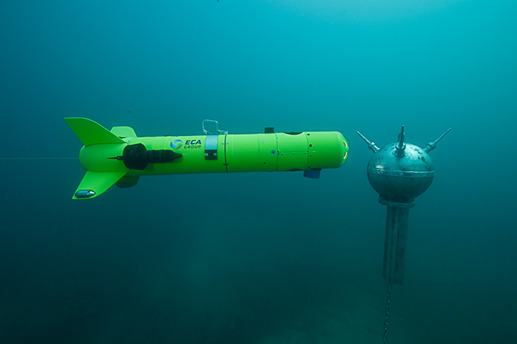 Thanks to a system entirely based on specialised robots, ECA says the mines are now detected using high resolution sonar fitted either on autonomous underwater vehicles or on surface drones, minimising the need for the mother ship to approach the mines. Once the sonar has detected potential mines, inspection robots are used to identify (confirm via video images that the object is indeed a mine) and a remotely-operated disposal vehicle is used to destroy the mine. These robots can be launched either from the mother ship or remotely deployed from the surface drone, thereby keeping the mother ship at a safer distance from the mines. Keeping the vessel in a standoff position relaxes the design constraints of the ship, says ECA. Thus the platform is less expensive than conventional minehunters, while being faster to reach the operation area and more flexible to be involved in other missions such as maritime surveillance. ECA developed a range of underwater robots, in addition to Unmanned Surface Vehicle Inspector-type surface drones. Used together on a single vessel, these different robots can perform full mine counter missions (as well as hydrography, surveillance, and research and assistance missions) through their sequential and/or simultaneous deployment. To manage the mission of various robots on the vessel, ECA developed an Unmanned MCM Information System. enabling the vessel to plan and conduct mine counter missions safely and effectively through the optimal operation of the various robots, and to incorporate the information collected into the naval customer's centralised management system. 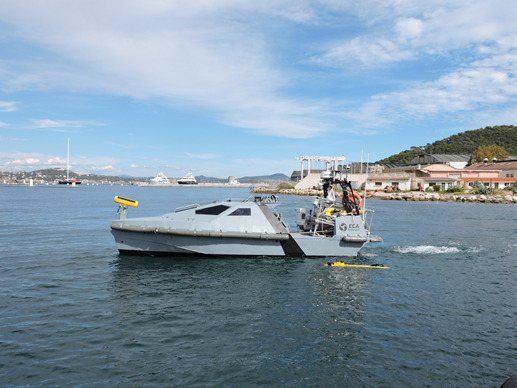 ECA says the robots can be adapted to the customer's operational requirements and budget: minimal configurations make it possible to carry mine counter solutions on smaller vessels (<30m), in particular where the requirement is limited to coastal mine counter measures. For planned mine counter activity requiring rapid mine disposal (for amphibious operations, for example), ECA says the configuration may incorporate several Inspector Mk2 USVs and AUVs, as well as one or two dozen mine killers on the same mine countermeasures vessel.